Web Dialer, Integration with Search and Social | 8x8, Inc.
Click any phone number in a web page to instantly make calls from your 8x8 Virtual Office extension. 8x8 Web Dialer. Turn phone numbers into clickable links. The 8x8 Web Dialer automatically highlights all phone numbers in your web browser as clickable links. Click any phone number to place a call through the 8x8 Virtual Office Windows or Mac app. No more copy & pasting or re-typing phone numbers. Save time on each call and avoid misdialed numbers. Big spreadsheet of numbers to call? 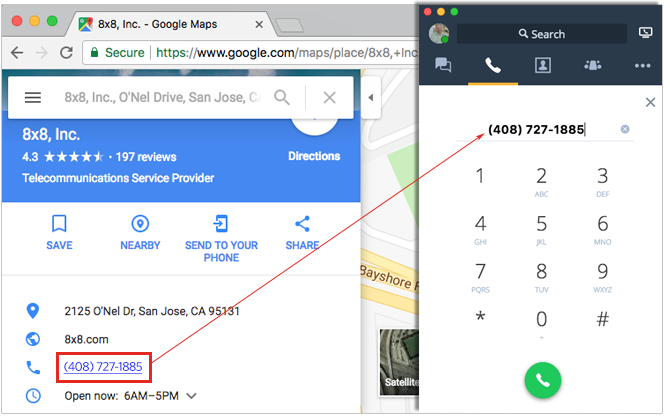 Save as an HTML file or load into Google Sheets, and open in your browser to create a clickable dialing directory. Choose the web dialer extension for the specific browser you want to install it in. 8x8 Click2Pop app opens the LinkedIn, Facebook, Gmail Contact profile or any web page based on an incoming caller’s name or phone number.